Parents listen intently as names are drawn. 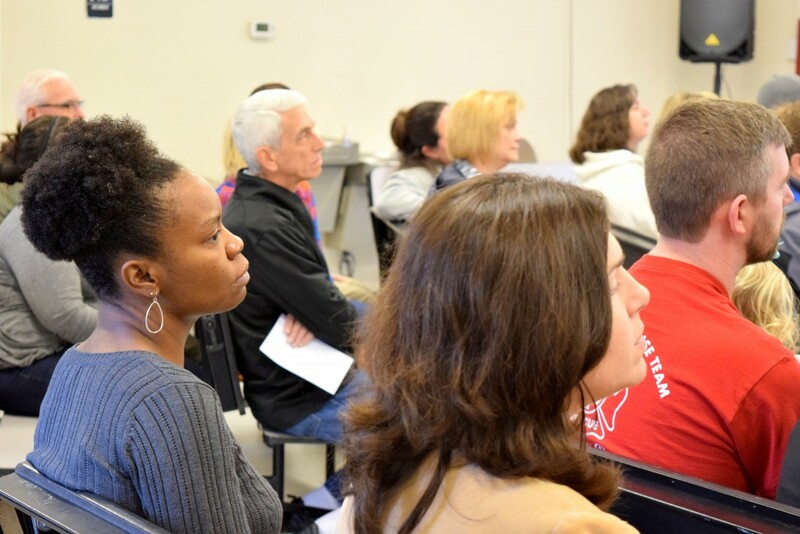 February 19, 2016- This week, local parents converged at Charter Day School in Leland to learn if their child’s name would be selected for enrollment in the school by a live, random lottery process. Charter Day School is a K-8 public charter school that is tuition-free and available to any NC student who chooses to enroll. The school currently serves approximately 920 students. While the school accepts any student who enrolls regardless of ability or income, the school does have grade-level capacity limits. Each January, the school holds its “Open Enrollment” period for the next school year. On January 31, all students are accepted unless there are more applications that seats available in their selected grade level. When this occurs, a lottery is required to fairly determine which students are placed in the available seats and which will join a waitlist. This year, all grades except fifth grade required a lottery at the K-8 school. In total, there were approximately 200 applications for 87 seats. Around 100 parents attended the live lottery held at the school, where administrators drew slips of paper with student names from a box, one-by-one, in a two hour process. At the end of the day, approximately 113 students joined grade-level waitlists for the school. Assistant Headmaster, Rosina Walton, shared that each year, many waitlisted students are able to attend the school. “Some grade levels have waitlists of five students, and some grade levels have waitlists of forty. It is not uncommon that, by the end of the first week of school in July, we have been able to accommodate as many as thirty waitlisted students per grade,” Walton explained. “Waitlists will continue to grow throughout the year, as parents can apply until school starts in July. Remaining seats in fifth grade will be distributed on a first-come, first-served basis. Waitlist positions in all other grades will be distributed in the same fashion. Parents who apply after the January Open Enrollment period still have good chances of making it off of a waitlist,” she continued. Though Charter Day School is a public school, it is a public charter school which means that it operates independently from the Brunswick County school district. Rather than the state-mandated program, which in NC, is Common Core, public charter schools can choose their own curriculum or educational focus. Public charter schools are required to take state End-of-Grade tests like traditional public schools. Charter Day School currently provides the top-scoring elementary and middle schools in Brunswick County on End-of-Grade tests. It uses a Classical Curriculum which, among other things, includes Latin and Cursive handwriting courses for all students. In an effort to meet parent demand and reach all interested families, Charter Day School has been replicated three times since its establishment in 1999. First, in 2007 in Whiteville at Columbus Charter School; in 2013 in downtown Wilmington at Douglass Academy; and in 2014 in Bolivia/Southport at South Brunswick Charter School. Each of these schools still has enrollment availability and will be accepting students on a first-come, first-served basis until the start of the 2016-2017 academic year. For more information on the family of schools, please visit www.rogerbacon.net.